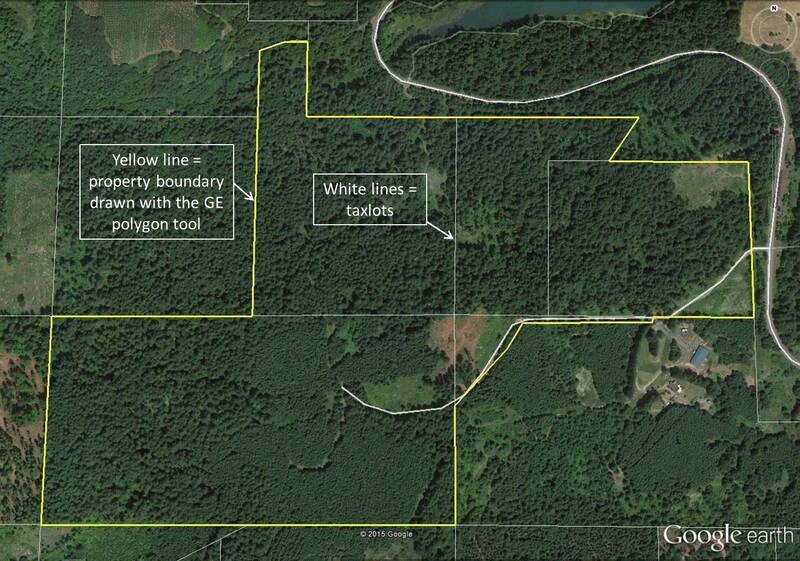 Eventually, the OSU College Forests staff will create a GIS map of the Matteson Forest with various spatial layers – property boundaries, roads, forest types, culverts, and so forth. 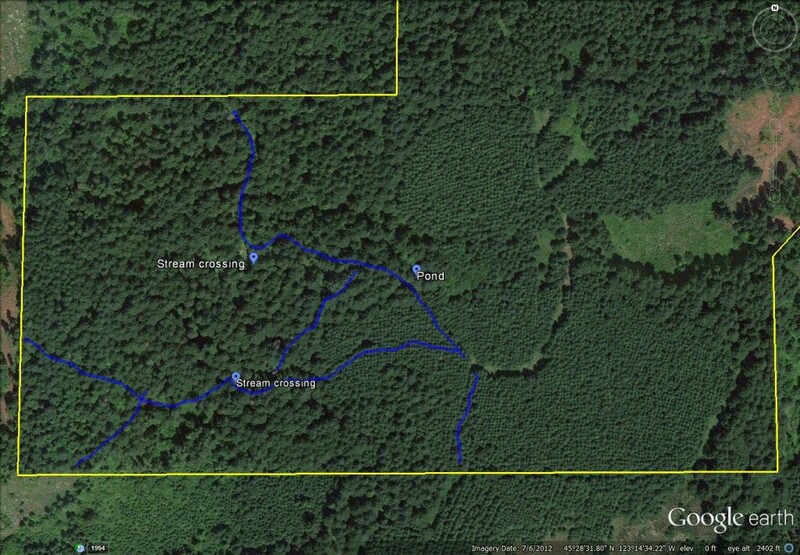 In the meantime, I’ve been using Google Earth to create my own map, adding information as I continue to explore the tract. While in the woods, I’ve been using a GPS app on my smartphone to keep track of where I am and to record points and paths. 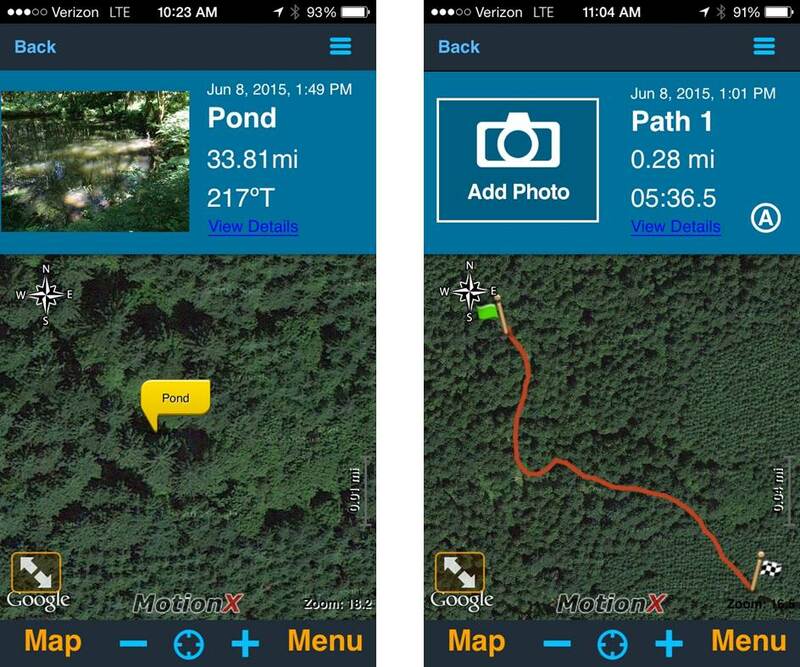 In this article I’ll describe how I’ve been using these two applications, which I think would be useful to most woodland owners who don’t have GIS at their fingertips. 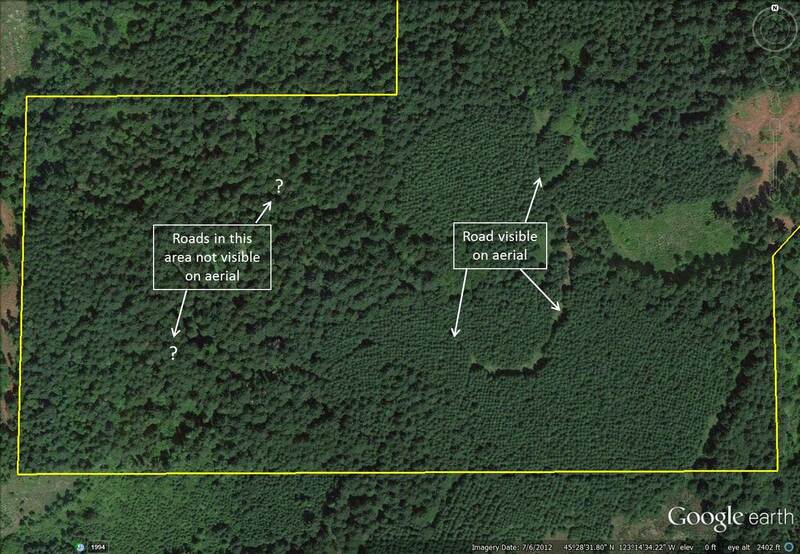 Some woodland owners are already familiar with Google Earth. For those that are not, Tristan Huff (OSU Extension Forester on the south coast) has developed a useful tutorial for landowners. I recommend the Pro version of Google Earth, which is now available for free (a recent change). In addition to all the standard features of Google Earth, the Pro version shows tax lot boundaries and allows you to calculate the area of a polygon that you draw. This enabled me to draw the Matteson property boundaries on my map with reasonable accuracy, by tracing the taxlot lines. On a recent visit to the Matteson Forest my goal was to map the roads and trails in the southern half of the property. Major roads stand out on the aerial photo, but walking the tract we’ve come across numerous secondary roads, trails and a small pond that are obscured by the canopy when looking at the aerial image. 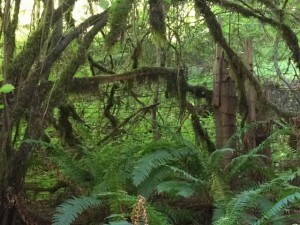 Mature timber in the southwest section obscures roads and trails in this aerial view. My iPhone GPS proved to be at least as precise as this handheld GPS receiver. A GPS receiver can be used to map them. 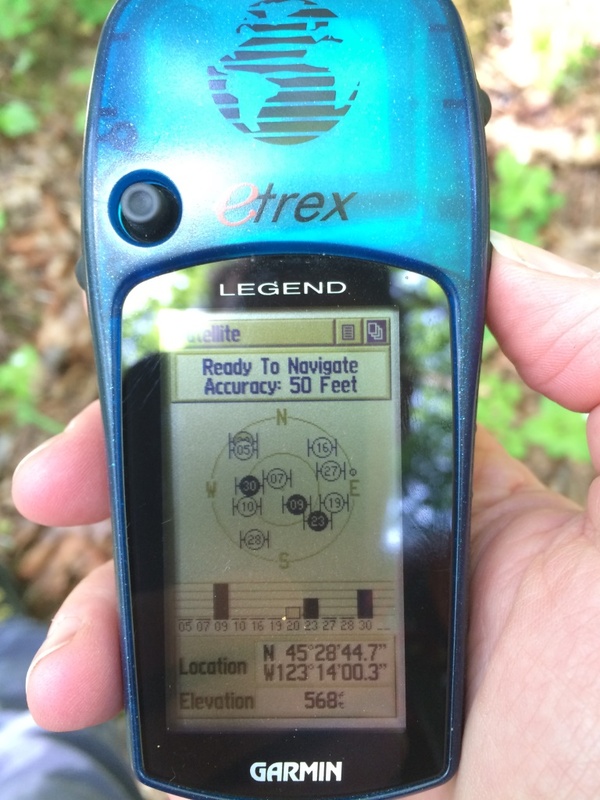 GPS receivers vary widely in their accuracy, especially under tree canopy; the most accurate systems are quite costly. Even a consumer-grade GPS receiver, which might be accurate to around 50 ft under tree canopy, can cost several hundred dollars. But, if you are one of the two-thirds of American adults that has a smartphone, you already have a GPS receiver built in. Why not use it? Doing some research I came across Motion X-GPS, an iPhone app available for the bargain price of 99 cents. Motion X-GPS uses your phone’s GPS receiver to track your location. This works in places where you don’t get a phone signal. You can record tracks and points as you move about. You can even take photos and associate them with a place or track. 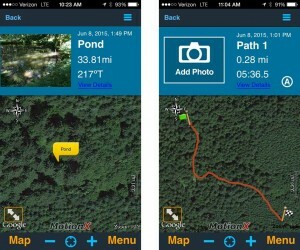 Motion X-GPS has good tutorials on their website, so I won’t go into much detail here on how to the app in the field. Below are two screenshots from my phone, showing a waypoint and a track that I recorded. After I was done for the day, the next step was to get these features from my phone into Google Earth. In Motion X-GPS you can share locations, tracks and waypoints to an email address. I simply emailed the tracks to myself. Opening up the .kmz attachment automatically opens the feature in Google Earth. From there I could save it to my map of the property. Here is my Google Earth map now, with all the features that I mapped in the field imported and saved. In summary, I give Google Earth Pro and Motion X-GPS two thumbs up. I’ve been using the latter for biking and running as well. To conserve my phone’s battery charge while in the field, I turned off the cellular receiver (there’s little to no cell signal on the Matteson Forest anyhow). Using the GPS app for 90 minutes consumed about 40% of my battery. Unfortunately, Motion X-GPS is not available for Android devices, but there are other GPS tracking apps that function similarly and are Android compatible.